A weighted warp loom is perfect for textured yarns. Unlike a traditional loom, where the warp is wound tightly onto the loom through a series of heddles and a reed that separate and lift different groups of threads, the warp hangs free and is moved by hand. Although this loom does limit the length of the fabric that you can weave, it allows you to put many more interesting yarns in the warp. It is simple and inexpensive to make (less than $10), and it takes up no more space than a window blind. Find a convenient place to hang your dowel with the bungees or the strong cord — for example, you can hang it from a curtain rod, an unused doorway, or between a pair of shelving units. If you can, mount two curtain-rod brackets on a wall and hang the rod from them. Make sure that the rod is hanging evenly. Measure how long you want your project to be. Double this number and add 10 inches. Cut your handspun to this length. 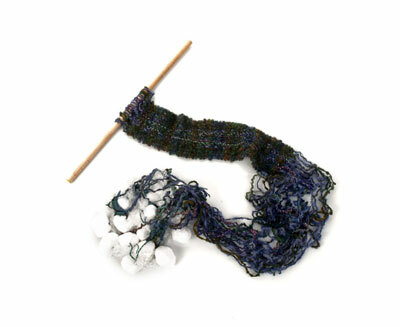 Fold a length of the handspun in half. Place the loop over the dowel, push the two loose ends through the loop, and pull the yarn snugly in place around the dowel. Repeat steps 3 and 4 to place as many lengths of yarn across the dowel as you need for the width of the project. You can use a variety of sizes and textures. In this example, the scarf is 8 inches wide. Cut a square of plastic wrap for each warp end. Place approximately 1 to 1.5 ounces of salt or gravel on the plastic wrap. 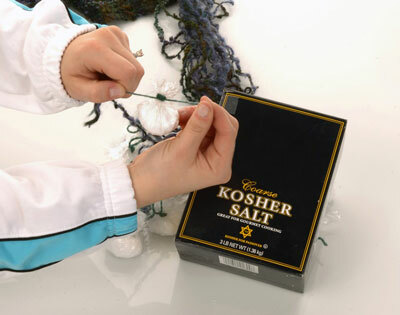 Fold the plastic wrap around the salt or gravel, and tie it up with the string. 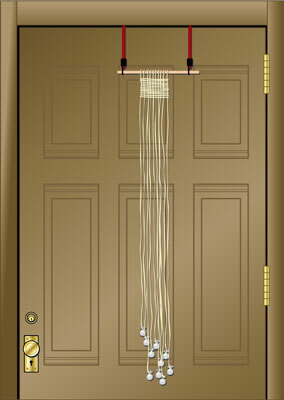 Attach a bag to each warp. Make sure that the weights are hanging free. If the warp doesn’t clear the floor, wrap it around the bag. These weights are reusable, and you can be creative with them. 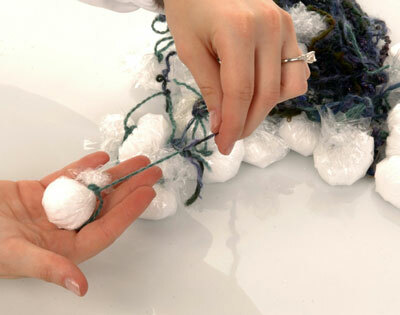 For example, you can make decorative cloth bags or bundles of metal, clay, or beads. The weights just need to weigh roughly the same amount. Now you are ready to weave! Check the spacing on the warp. If the threads look too close together for the fabric that you want to weave, slide them apart. If they look too loose, push them together. Lift the warp threads with your fingers in the weaving pattern that you want to use. This scarf is woven using a plain weave — one thread up, one thread down — because this simple structure shows off the texture of the handspun. Enter the weft at the top of the warp. You can wind it into a small ball or around a flat weaving shuttle to keep it tidy. 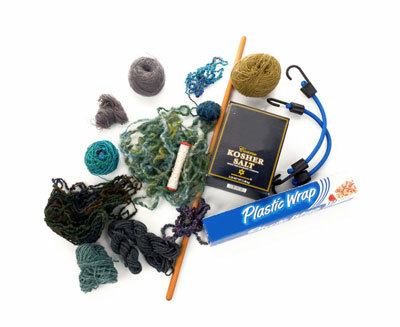 Beat the weft in place with a tapestry beater or a kitchen fork. Unlike most modern looms, this weft is beaten up into the warp instead of down. For this scarf, a gentle beat works well. For rugs, a firmer beat works better (this is the same loom on which Vikings wove their rugs). Portable clothes racks make a great weighted warp loom — just use the rack instead of a dowel. Attach the warp directly to the top of the rack.